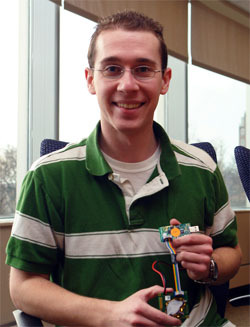 Matt Beaman (pictured) and Prof. Zhiyuan Li are using the Lawson Building for their carbon dioxide sensor project. Purdue computer science researchers are working toward a cleaner, greener world; and trying to help building owners save some cash as well. Professor Zhiyuan Li and CS graduate student, Matt Beaman are currently using the Lawson Computer Science Building as a testing facility for their carbon dioxide (CO2) sensor project. Their work will ultimately lead to a better design of ventilation systems which can decide when a building needs to take in outdoor air. The carbon dioxide sensor project offers a solution to maintaining American Society of Heating, Refrigeration, and Air Conditioning Engineers (ASHRAE) carbon dioxide standards without unnecessarily taxing the HVAC system with heating or cooling unneeded outside air. ASHRAE recommends carbon dioxide levels reach no higher than 1,000ppm for schools and 800ppm for offices. That requires 15 cubic feet per minute (cfm) of outside air per person in a classroom and 20 cfm per person in an office. Currently the HVAC system pulls outside air into the building to cover maximum capacity carbon dioxide levels, but when rooms are emptier this is not necessary. Ventilation controllers which monitor indoor carbon dioxide levels are now commercially available, but they take measurements at one location and therefore do not have a full view of the air quality inside the entire building. Li and Beaman, instead, take a multi-zone approach by placing a network of carbon dioxide sensors to simultaneously monitor individual zones throughout Lawson, such as classrooms, hallways, office spaces, and the common area. The sensors pick up carbon dioxide readings and transfer the readings to a base station by hopping across other sensors in the ad hoc network. The base station uploads the data to a server dedicated to the project via the Purdue PAL 2.0 wireless network. Li and Beaman, along with ECE faculty Bagchi and Lu, have undertaken a research project sponsored by the National Science Foundation to make sure that sensor networks like theirs will function highly reliably. They are also working with researchers from other departments to design new HVAC system control strategies which can take advantage of the multi-zone sensor readings to maximize energy conservation while keeping the air quality at a healthy level in the building. 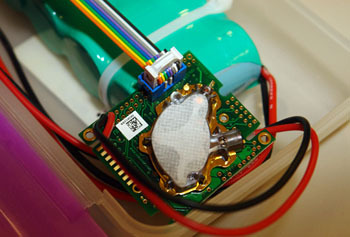 The carbon dioxide sensors are bundled with a battery pack and a wireless card to transmit readings through the Purdue PAL 2.0 network.